The Vollrath 59300 countertop induction range is portable, allowing you to set up and cook anywhere you can plug the unit in. This range requires induction-ready pans, and can be used with pans up to 14 inches in diameter. 20 power levels and a temperature range of 100 to 400 degrees Fahrenheit allow fine control over how the food cooks and how the unit responds to a variety of induction-ready pans. The easy-to-read LED screen make these settings simple to control. 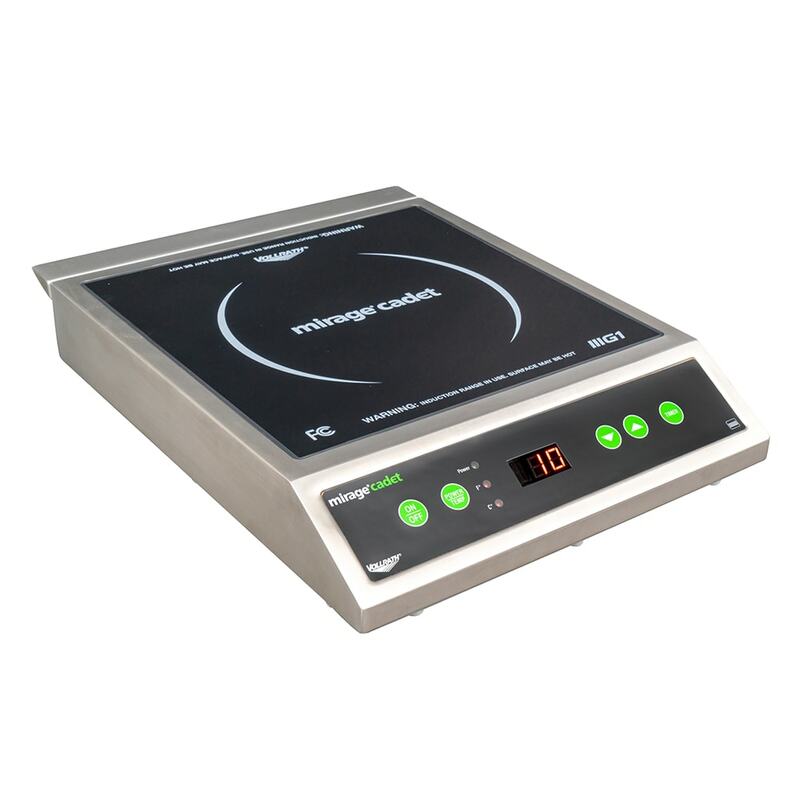 This induction hotplate has several safety features to protect both the equipment and the operator. Over-heating protection keeps the unit from burning out, and pan detection ensures that the unit is only running when a pan is present. To help prevent burns, the LED screen will read 'hot' even after the unit is turned off until the cooking surface has cooled off. The range includes a timer that can be set for 1 to 180 minutes to help ensure consistent cooking results every time. Can use pans with a diameter up to 14 in. "I have had two of these over the last 6 years. One lasted 18 months before needing repair, the other about 24 months. Can only be repaired at Vo..."
"I bought this expecting a long life but it lasted only three years with once a day use in our little kitchenette. I paid over $200 and replaced i..."
"A friend bought this for me to use at my cabin. I brought it home at he end of the season, what a great device. Precise temperature control, heat..."
"I have had two of these over the last 6 years. One lasted 18 months before needing repair, the other about 24 months. Can only be repaired at Volrath, Shipping plus $130 diagnosis fee. Work well when not broken." "I bought this expecting a long life but it lasted only three years with once a day use in our little kitchenette. I paid over $200 and replaced it with a $70 one that works just as well. I can buy a new cheap one every year for three years and break even." "A friend bought this for me to use at my cabin. I brought it home at he end of the season, what a great device. Precise temperature control, heats water in no time, makes popcorn without burning. I'm going to buy another one." "I bought this on 2-23-12 thinking it would hold up better than the cheaper ones. I cook one omlette each morning for 22 months and it died. No power just clicking sound. Vollrath says these are disposable don't service them. This is made in China. Other than short life I was happy with this. Do I now buy the Mirage Pro or the $128. models?" "I use this countertop range to heat Taiwanese-style hot pot at the dining table, and with the timer function to finish off foods cooked in a pressure cooker (which allows me to leave the house without leaving my gas range on). For both of these purposes, this range performs excellently. The only thing I dislike about the range is that the 4 rubber feet are not perfectly flat (the unit will wobble slightly without a heavy pot on top of it when on a flat surface)."